If you have ever had to undergo a move you are bound to know how much of a hassle it actually is. There are so many factors with the actual potential of going wrong it is ridiculous, and this is not even including the thousands of items that you need to keep track of. Instead of going through this by yourself you can simply rely on the man and van relocations we offer in Colindale. The home and office relocation business is an extremely competitive and quickly expanding one. The huge demand for this otherwise unassuming service has led to the appearance of hundreds of companies not unlike ours. what separates us from them, however, is our unfaltering motivation and our years of experience. We doubt you would want anything less than the most handy and careful people handling your precious belongings so we have made sure that only such licensed professionals are in contact with your property. Our company is not quick to hire new employees, as we always verify their skills and experience first. Even the most qualified workers need to undertake our training regimen, which ensures their proficiency at multiple different types of services. Our workers are among the best packers in the industry and considering that we use only the highest grade of packing equipment you can be sure your items will be safe. Our state of the art vans are equipped with the proper moving belts and moving straps, a thing many companies neglect, leading to otherwise avoidable damages. Our experienced drivers are sure to deliver their cargo anywhere in NW9 safely and quickly. Our competence does not end with regular man and van services, far from it. Our workers are capable of performing a whole gamma of supplementary services as well. We are well versed in single item deliveries as well as assembly services and van hire services. Remember to use our work in conjunction with one another to save yourself time and money. Our work is also open to negotiation, if you want to hire a specific aspect of it have us do custom jobs. Hiring our services net you a great deal of additional benefits. Reaching us in Colindale can be done by phone or online for your added convenience. You can enjoy our full insurance as well as our business friendly and family friendly working times. Remember to ask for our free price quote as the cost of a specific service depends on the work that needs doing. Unevenly split between the London boroughs of Brent and Barnet (located predominantly in the latter), Colindale is a residential district in Northwest London. 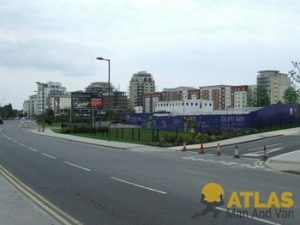 All the way until the 20th century Colindale contained nothing but a few buildings and the families that resided there. The enormous urbanization of other parts of London and the relatively low price of the land in the district eventually attracted people who wished to live there. A tube station opened in the 1920’s. You can book us at any time of the day, even on a short notice as we are open for business 24-hours a day and operate with a flexible schedule that always has free slots for new removal projects. Since the satisfaction of our clients is our main concern, we are ready to round the clock and carry out late night operations in order to complete the jobs for which we are hired in a safe and timely manner. After all, we are known to provide the most dependable man and van services in Colindale, NW9. Colindale, NW9, is a London area with a population of about 17.000 people. The noted junction of Charing Cross is situated at exactly eight miles from the district, which has a mainly residential character. The is home to the Hendon Police College, London’s principal training facility for local policemen. The college dates back to the mid-1930s and was the subject of a major redevelopment project from 2014 to 2016.